Coba is a wonderful archaeological site with an interesting construction dating from the pre-Hispanic period between the years 500- 900 of our era, has an extension of eighty square kilometers and is located 20 minutes from the archaeological zone of Tulum. Come to know and explore its interesting buildings such asThe Castle, The Pyramid Nohoch and The Astronomical Observatory, stone structures that have a natural beauty and an outstanding history, surrounded by five lakes and a landscape of tropical forest invites to adventure. Coba is located in the state of Quintana Roo near the border with the state of Yucatan, 132 km from Cancun and 109 km from Playa del Carmen. 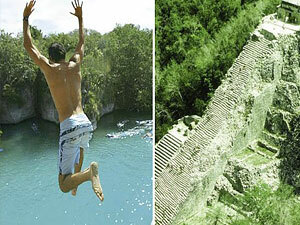 Coba Express guided tour available on Tuesday andThursday, departing from your hotel in Cancun or Riviera Maya. Round transportation from your hotel in air conditioned vehicle. Kids under 5 years old are free and do not need to be reserved. Wear shoes and comfortable clothes, sunglasses, cap, sunscreen and repellent for the trip. Bring cash or credit card for purchases and personal expenses or take video in the archaeological zone. In case of using a wheelchair, we recommend to go with a companion.